Fourth Skywalker Trilogy Coming After Long Star Wars Movie Break? Next month, Disney and LucasFilm will reportedly showcase the first Last Jedi trailer during Star Wars Celebration, which takes place April 13 through April 16 in Orlando, Florida. Production is also under way on the Han Solo spin-off, which is slated for release in May 2018, with Star Wars: Episode IX also being worked on for release in 2019. 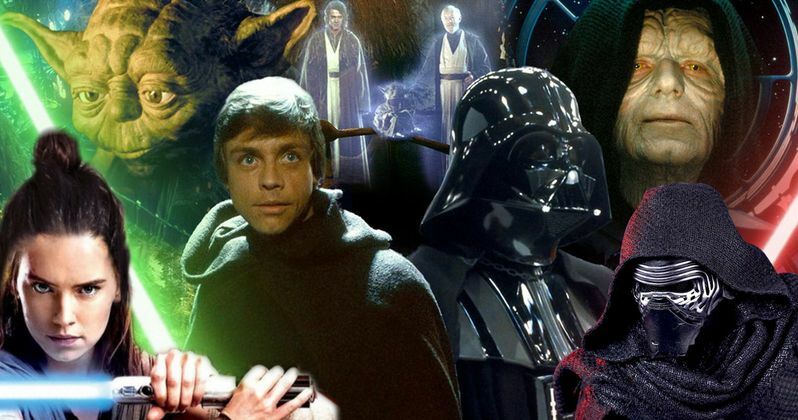 While we know the franchise certainly won't come to an end with those movies, Disney and LucasFilm still haven't revealed much beyond what has already been announced, although a new report teases that, eventually, a new Skywalker family trilogy will in fact happen. This report comes from Star Wars News Net, whose sources also offered new details about an Obi-Wan Kenobi spin-off, another spin-off focusing on Boba Fett and other bounty hunters, along with a potentially controversial project that is being crafted as a young adult romance story. At the end of this comprehensive report, though, they added that there are in fact plans for a fourth Star Wars saga trilogy, but that likely won't be coming anytime soon. Here's what the site's unidentified source had to say below. "Since Star Wars is a generational thing, there will be a gap between the Sequel Trilogy's end and the new trilogy's arrival." The source didn't indicate how long the gap between trilogies may be, but it certainly could be sizable. Fans had to wait 16 years after the last original trilogy movie, Return of the Jedi, for the first movie in the prequel trilogy, 1999's The Phantom Menace. After 2002's Attack of the Clones and 2005's Revenge of the Sith, fans had to wait another 10 years for this current trilogy to begin, with the critical and commercial blockbuster The Force Awakens. Still, while fans may have to wait a decade or more for a new trilogy, there will certainly be not shortage of Star Wars movies in the interim. There was previously a report that claimed Disney plans on releasing one Star Wars movie per year, indefinitely, with Disney CEO Bob Iger recently claiming that the studio has Star wars movies planned up until the year 2030. This new report, however, claims that LucasFilm will enact a hiatus on Star Wars movies a few years after the sequel trilogy wraps up, to avoid oversaturating the marketplace. During that time, the studio will reportedly focus on new Star Wars TV shows, which makes sense since Star Wars Rebels creator Dave Filoni was recently promoted to oversee LucasFilm's entire animated slate, and while no new shows have been announced yet, there have been rumors that Star Wars Rebels may be coming to an end in the next few years, paving the way for new shows to be launched. As for this new trilogy, it remains to be seen if it will still follow Luke Skywalker, or other members of his family, but it seems likely since all three trilogies thus far have followed his blood line. There have been plenty of rumors that claim Rey (Daisy Ridley) is Luke Skywalker's daughter, but that hasn't been confirmed, and likely won't be addressed officially until Star Wars: The Last Jedi hits theaters on December 15. Still, none of this has been confirmed yet, but this report also claims that Disney and LucasFim may be ready to make some big announcements during Star Wars Celebration in just a few weeks.